This pattern is easy-to-make and recommended for you if you have never made an egg basket. You'll learn the Kentucky-style 'eye' and rib construction. The spherical shape makes this the simplest egg basket. Calculate Supplies for 1 to 20 Melon Shaped Egg Basket baskets with the Basket Supply Calculator. The Supply List gives you the least expensive way to purchase the supplies for your quantity of baskets. View on-line or print to your printer. Video Instruction: Lashing the Eye of an Egg Basket - PHOTOS and VIDEO. This supplement to the instructions below shows an easy way to nail your hoops together and a video showing how to lash the 'Eye'. 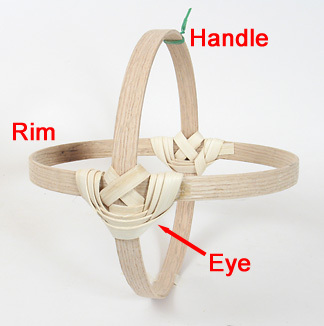 The 'eye' of an Egg Basket or Rib Construction Basket is used to tie the hoops together and give the ribs a place to rest. Many times the hoops are nailed together first then lashed. 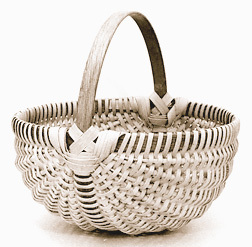 The 'eye' of an Egg Basket or Rib Construction Basket is used to tie the hoops together and give the ribs a place to rest. These instructions show an easy way to tie the 'eye' found on many white oak egg baskets from Hart County and the Mammoth Cave area of Kentucky. 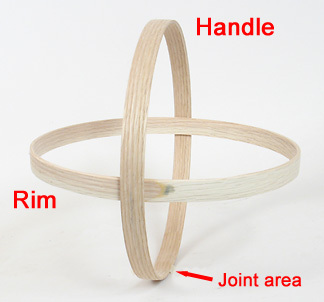 Measure and mark the half-way points of both the handle and rim hoops. The handle and rim will cross each other at these points with the handle on the outside of the rim. Make sure the joint area on the handle is at the bottom of the basket. 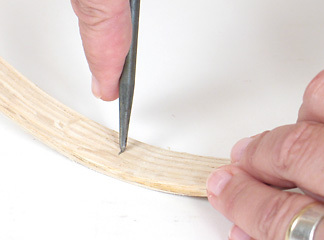 Make an indentation with your basket awl on the inside of both the handle and the rim at the marked half-way points. 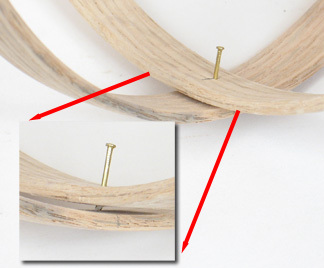 Place a #18 5/8" brass pin or nail in the indentation on the inside of the rim and, with a pair of pliers, squeeze the nail through the rim from the inside to the outside. 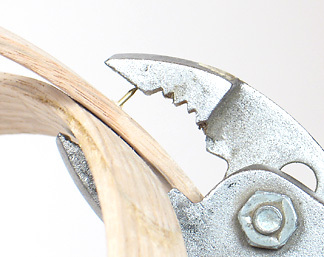 Notice that the head of the nail is being held by the 'jaws' of the pliers. Stop when you feel the point of the nail on the outside of the rim. Repeat this on the other side of the rim. 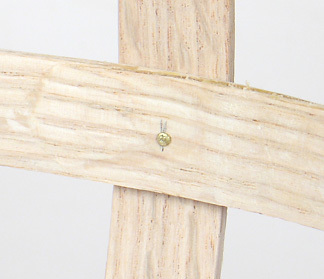 Next, align the point of each nail with the indentation on the inside of the handle. 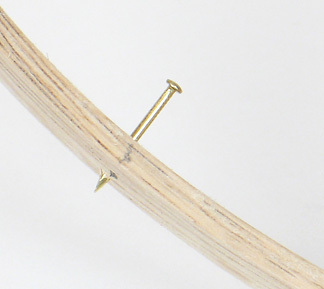 Squeeze the nail all the way through both rim and handle. Make sure you miss the pliers as the nail emerges. Do this for both nails. 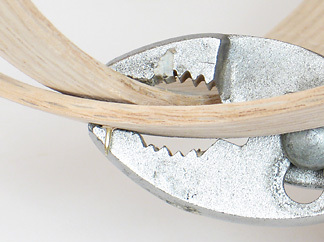 Position the pliers on your nail and with a good squeeze the nail will bend. Again do this for both nails. 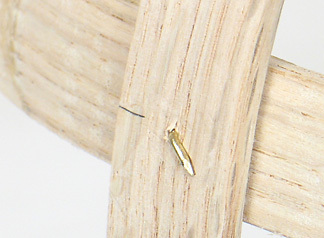 Notice that both the head and the point of the nail are touching the flat part of the jaw tips. Bent nail on the outside of the handle. 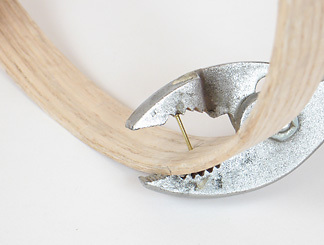 Head of nail on the inside of the rim. The following video shows lashing the 'eye' of an egg basket using a wet 4 foot piece of 1/2" flat reed.